I have a confession to make: I am not excessively fond of Caroline Bingley. I’ve thought about her a lot lately, as there seem to be increasing numbers of fanfic stories that feature her as their central character. I must admit, it is hard for me to read these. I find Caroline incredibly annoying and envy anybody with the writing talent to make her into a likeable, sympathetic character. To my fellow authors who dare to take on this domestic diva: you rock!!! I finally decided to take a closer look at her character and discover why so many people enjoy writing and/or reading about this vapid personality. In the process, I discovered again the genius of Jane Austen. Quite a contrast, isn’t it? Did Austen plot all of these opposites out, or did they just come out of her pen without a lot of forethought? Caroline is drawn so true to life that I suspect Austen probably knew many Carolines in her lifetime! Caroline does provide some comic relief, which prevents her from being a totally detestable character. It’s funny to read about her machinations to get Darcy to notice her, which always fall flat. Remember this scene? Interestingly, Elizabeth and Caroline both exhibit Darcy’s twin faults of pride and prejudice. The difference is that Darcy and Elizabeth show a capacity to learn from their mistakes and overcome their faults, but Caroline does not. She doesn’t even see her own faults, let alone try to learn from them. She regrets her mistakes only because of the effect they might have on her in the future, such as losing her chance to spend time at Pemberley after Darcy and Elizabeth are married. This crucial difference between the two women shows us, as the readers, that Darcy and Elizabeth are going to make a match. Caroline looks perfect for Darcy, on paper, but it is Elizabeth who is his ideal counterpart in every way. So there it is-the genius of Jane Austen. She created a secondary character who shows how perfectly the hero and heroine go together, and she does it with humor, creating a personality we all recognize in real life. Caroline Bingley is the perfect opposite for the perfect character in one of the world’s most perfect books. What do you think? 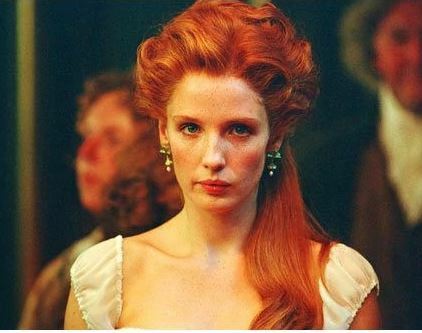 Do you love Caroline Bingley, or is she one of those characters you love to hate? What is your favorite Caroline Bingley moment? Tell me in your comments below! Caroline is one of my favorite secondary characters (together with Mr. Collins) who are wonderful material for JAFF authors. She can either have redeeming qualities or be extremely evil. I love evil Caroline. Your description of her is spot on. I actually admire EB, coz she holds her tongue or if not she is able to sway where it is still in the boundaries of being polite. Well I did mention her being hypocritical and faking friendships, but you’re right, I forgot about her being delusional. On her own she can never match Elizabeth’s pedigree, so she has to hope her fortune can buy her a marriage into the true gentry. She might put up with a lot out of a potential husband just to have that opportunity. I personally like to make mischief on Caroline in my stories so I suppose she gives us a little comic relief. I would like to think that every person can learn from their mistakes and I can see why some authors try to give her a change or heart in their sequels. Fun speculations. Some day I might try to write a “redeeming Caroline” story, but I’ll probably leave that challenge to braver authors! You left out two of Caroline’s most notable traits. First of all, she is a back biter of the first order. She is all sweetness to Jane’s face, but plots against her as soon as Jane is out of sight. She definitely has the knife out when she indicates that Charles might be matched with Georgiana in her letter. Secondly, she is delusional. She sees herself superior to Lizzy when the opposite is true. I am not talking personality or intelligence, but their respective places in the world. Elizabeth Bennet without a farthing to her name is a better catch than Caroline. Elizabeth is a gentleman’s daughter. Caroline’s money comes from trade. Realistically, Caroline’s best chances are to either marry a tradesman or to find an impoverished gentleman who would marry her for her money. What wealthy businessman would put up with her mouth? If she got the second option, how long would it take her to realize she was footing all the bills? If said gentleman was impoverished due to drinking, gambling, etc., how long before she’d be living with the Hursts or the Bingleys without a penny to her name? Thanks for a great post! I also dislike Caroline but understand that she was desperate to make an advantageous match (similar to Mrs. Bennet’s desperation for her daughters.) Without a suitable marriage, even at her tender age, she would be considered a spinster, an unenviable position in society. Oh dear, now a feel a plot bunny trying to distract me. Ha! BTW: Jennifer Becton wrote a great Caroline Bingley P&P continuation story . Give it a try. I’m glad you liked the post! I’ll have to check out the Jennifer Becton story. Caroline stories are hard for me to get into, but if you say it’s good it must be! Caroline is definitely a character I love to hate. My favorite moment is when Darcy puts her in her place (in your sample above). Or when Elizabeth talks circles around her. Which Elizabeth does so often! Ha ha! I kind of love Caroline. I think seeing Lost In Austen Gabe me this ‘aha!’ moment and I realized Caroline sees herself as much smarter than her brother, but as a man he has the control over her (theoretically lol) and it’s just incredibly frustrating for someone that type A to know she should be in charge. You’re right, I never thought of that! Of course Caroline would think she is smarter than Bingley. She might even be right, at least in some ways. But she has never learned that being kind trumps being smart. Oh, dear, I’m starting to feel a plot bunny coming on . . .
For me, she is definitely a character I love to hate. I especially love it when she gets her just desserts and ends up with someone like Mr. Collins or Wickham or someone who she thinks is beneath her. I’m seen stories with Caroline and Wickham together, and those always seem to work. I don’t know who I’d feel sorrier for in a Collins/Caroline union. Probably Collins, but it’s a tough call. Caroline is a character you love to hate! Cool post! Oh Caroline is one of those characters I love to hate. Thank you for the great post! Thank you, Caryl. I may have to investigate Caroline even more now that I’ve started to really analyze her personality.